OK, I'm back and I'm mad! This one is going to be a rant. I have a question for everyone who sets up audition "cattle calls" for these American Idol shows and spin-offs. Why do you have singers standing in the extreme cold from the wee hours of the morning (say 3 or 4 o'clock am) until you finally allow them to sing- cold, tired and numb- sometime in the latter part of the day? Do you know these are human beings? Do you know that their voices, not to mention their bodies, are affected by such abuse? These people are worth more than this. They allow themselves to be treated this way, then usually leave with their hearts broken. Yes, the music business is hard, but does it have to be CRUEL? Why can't you designate a warm, dry, safe place somewhere for people to wait for their auditions? Maybe have a cutoff after so many show up, then hold auditions for more days? You know, money considerations sometimes have to make room for basic human rights. If you auditioners ran a third world country, we might not be trading with you. I've heard these horror stories from my clients for a couple weeks in a row, and I'd like to join any other voice teacher who'd like to throw in on this protest. I'd also like to hear from any of you reading this blog who have had similar experience with this kind of auditioning. Maybe we can raise our voices and get these practices changed. Click the comment link and tell us your story. Performance body language- anything but stiff! 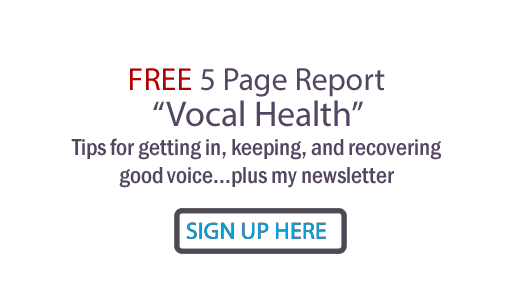 Phone Vocal Lessons - Do they work?